Play “Hooky” from work for a day and SAVE. No minimum stay during the week. The more you stay the more you save. First night 20% off, second night 30% off, third night 40% off. Offer valid Sunday to Thursday only, October to December 2014, Excluding Thanksgiving week. Code for special is GOING FISHING! Take a break and get away before winter! Enjoy a relaxing weekend before winter comes! “Get in Free” We’ll pay your admission for this annual event! 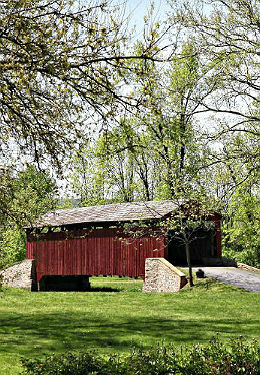 See the restored Covered Bridge, the Limekiln and the Mansion. Silent auction, delicious food, craft demonstrations, tractor rides, and a new addition to the park, a covered wagon are all in this beautifully shaded park. Just a half mile from the Inn www.historicpooleforge.org . Largest Number of Guests from the Most Countries! Thanks to our very interesting guests who livened up our Labor Day Weekend. We had our own “League of Nations” with representation from Canada, India, Haiti, Germany, Ukraine, Finland, and Portugal! We Americans were fortunate to have an opportunity to share morning coffee and a garden view breakfast while getting to know each other. Later in the early evening, we shared a meal at our Amish friend’s home sitting around the table eating delicious family-style, homemade dinner. Yum!